This elegant setting features a vibrant mix of shops and restaurants. Take a stroll down Palmer Alley to enjoy the stringed light displays while window shopping, especially during the holiday season. The neighborhood hosts a variety of outdoor festivals and events throughout the year. The annual peak bloom period of these iconic pink flowering trees means that spring and love is in the air. 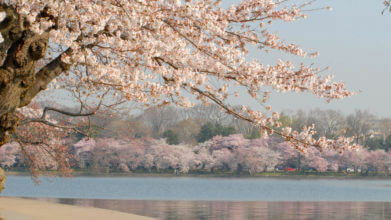 The famous month-long celebration takes place alongside the scenic Tidal Basin. Engagement, wedding and other romantic photos are often captured beneath these picturesque trees. This public green space offers the opportunity to create cherished moments throughout the year. In the summer, you can enjoy smooth jazz during Friday night concerts. When colder weather arrives, the space is transformed into a skating rink where couples can glide arm-in-arm. The famous AMOR sculpture by Robert Indiana is a popular place for a first kiss. After the tourists have gone for the day, couples linger beside the columns of this famous memorial for a picturesque view of the sun setting over Arlington across the Potomac River. This serene and lovely setting is often chosen as a place for a public proposal. One of the city’s most noteworthy spots, the market is filled with artisan eateries. The famous Heart Wall is the perfect place to confess your love for one another. The Heart Wall is a mural created for International Women’s Day in 2015 by Los Angeles-based graffiti artist Mr. Brainwash. Pull your soulmate in close for the perfect photo as you share that special moment of a first kiss or marriage proposal. The Bishop’s Garden is designed to emulate the walled-off grounds of medieval European castles and cathedrals. It features walking paths that wind their way through rose gardens and other gorgeous landscaping. The colorful backdrop is ideal for a spring picnic or a romantic proposal. Enjoy an evening of merriment as the sun goes down and the District is transformed into a different city. The formality of daytime business and politics gives way to fun under the stars. 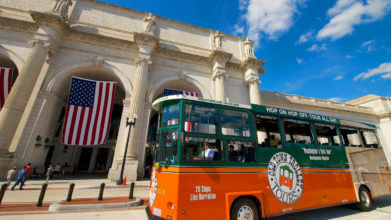 Climb aboard the Old Town Trolley for a unique way to view some of Washington’s most famous landmarks. Hear an informative narration as you experience majestic monuments and memorials lit up by moonlight, the stars and decorative lighting. You can experience the beauty and awe of these stirring landmarks in a completely new way while enjoying a tranquil evening that shows off the Capital City in just the right way. Walk hand in hand along the banks of the scenic Potomac River. This lovely stroll affords romantic views in every direction especially when the cherry blossoms are in bloom. You can also schedule an evening cruise on a dinner boat. Experience the enchantment as you sail down the river with the illuminated skyline as the backdrop for a romantic dinner. Sitting on the highest point in Georgetown, this idyllic spot feels like a secret sanctuary free from the hustle and bustle of the city. Along with a bed of 900 roses, the gardens feature day lilies and sprawling forsythia as well as apple, peach and cherry trees. The pastoral setting of this romantic DC hideaway stirs the heart to feelings of love and commitment. The first Thursday of the month, the country’s earliest museum of modern art hosts a cocktail party with food and live music. The stunning collection of Impressionist and modern artists features works by Cezanne, Matisse and El Greco as well as Picasso and O’Keefe. Couples have been known to pop the question while viewing the collection’s “Luncheon of the Boating Party” by Renoir. With famous works like “Romeo and Juliet,” Shakespeare is synonymous with love. You can celebrate the Bard’s renowned characters and classic plays inside this intimate Elizabethan-style venue. The theater also hosts concerts featuring early music as well as modern performances based on Shakespeare’s works. With its 13-basin, cascading waterfall fountain and reflecting pool, this 12-acre formal Italianate-style park is open during daylight hours. On a warm day, it is the perfect spot for a pleasurable afternoon of getting to know one another. On Sundays, musicians gather for impromptu performances. The drum circle is one of the city’s cultural institutions. There are nearby watering holes with rooftop bars where you can enjoy the sunset. Like business and politics, love is all about building a relationship. With famous monuments, romantic museums and scenic landmarks forming a picturesque backdrop, the District is an ideal setting for creating and renewing romantic bonds with someone special.